In a surprise twist, Fox Searchlight's Super Troopers 2 zoomed past Amy Schumer's new comedy, I Feel Pretty, to win the Friday box-office race with $7.9 million from 2,038 cinemas. I Feel Pretty grossed $6.3 million from 3,440 locations. Nevertheless, it's still not clear how the full weekend will play out. Most estimates show A Quiet Place winning the weekend with $20 million or more from 3,808 theaters — an impressive feat considering John Krasinski's high-concept horror film is in its third weekend. I Feel Pretty hopes to overtake Dwayne Johnson's Rampage, now in its sophomore outing, and come in No. 2 with $18 million (Rampage had hoped to win the weekend).That's ahead of prerelease tracking, which had suggested a $13 million-$15 million debut for I Feel Pretty. Many box-office observers are predicting that Super Troopers 2, despite winning Friday, will be front-loaded and hence place No. 4 with $15 million-$16 million. STX always believed there was room for upside if femmes turned out in force to watch Schumer in her latest turn on the big screen. I Feel Pretty is rated PG-13, compared with a more restrictive R for Trainwreck (2015) and Snatched (2017), which debuted to $30.1 million and $19.5 million, respectively. Voltage financed the $32 million film, with STX acquiring U.S. rights for $15 million. In the movie, directed by Abby Kohn and Marc Silverstein, Schumer plays a woman who believes she looks like a supermodel after bumping her head in a spinning class. The movie's current score on Rotten Tomatoes is an unenthusiastic 35 percent, while the film earned a B+ CinemaScore from audences. I Feel Pretty co-stars Michelle Williams, Rory Scovel, Emily Ratajkowski, Aidy Bryant, Busy Philipps, Tom Hopper, Naomi Campbell and Lauren Hutton. Schumer has responded to criticism from some on social media that the movie's trailer encouraged body shaming by saying that her character suffers from low self-esteem and that I Feel Pretty sends a positive message. I Feel Pretty's Friday gross was ahead of the $5 million earned by Snatched. Fox Searchlight's Super Troopers 2 — a follow-up to the 2002 cult hit — is doing more than double the business prerelease tracking suggested it would. The sequel was written by and stars the Broken Lizard comedy troupe; Jay Chandrasekhar, Brian Cox, Kevin Heffernan, Steve Leme, Paul Soter and Erik Stolhanske. The first film launched to $6.2 million domestically. This time out, the oddball troopers attempt to resolve an international border dispute between the U.S. and Canada. The movie's Rotten Tomatoes score is presently 33 percent, compared with the first film's 35 percent, and it earned a B+ CinemaScore from audiences. 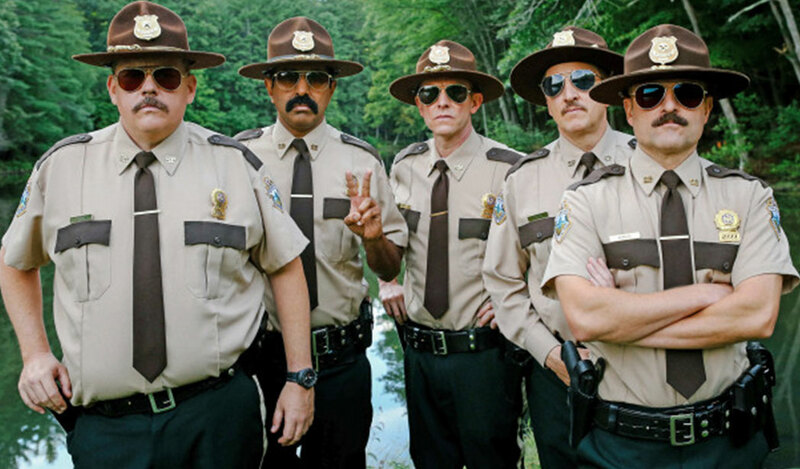 Super Troopers 2 was financed by a crowd-funding campaign that raised a hearty $4.4 million. Codeblack's and Lionsgate's thriller Traffik, the weekend's third new offering, is pacing to bow to less than $4 million for a 9th place finish. Directed by Deon Taylor, the R-rated pic revolves around a couple (Paula Patton and Omar Epps) who are terrorized by a biker gang at a remote country getaway. Traffik is playing in 1,046 theaters. Back in the top five, Universal and Blumhouse's Truth or Dare is projected to place No. 4 with $7.7 million for a 10-day domestic total of $30.2 million. Warner Bros. and Steven Spielberg's Ready Player One and Unviersal's Blockers are in a close race for No. 5 with an estimated $7 million each. Warners announced Saturday that Ready Player One has crossed the $500 million mark globally, only the second Hollywood film of the year to do so behind Black Panther. It is also the first film Spielberg has directed to earn north of $500 million since Indiana Jones and the Kingdom of the Crystal Skull ($786.6 million) in 2008.